Sand. Has there even been such an intense study of sand? Oh, Lawrence of Arabia has heaps of it, but it’s an abstraction, a blank canvas against which figures are framed. Here Teshigahara really gets down to the nitty-gritty (pardon the pun) of sand. The way individual grains cling together, forming a surface until broken by weight. It moves in sheets and clumps and piles and gusts. It gets into everything. It sticks to your flesh, adhering with sweat to the skin and getting into every crevice. It takes root in your hair, it holds on to your eyelashes. In this movie, sand’s invasion is as relentless as water in a Ming-liang Tsai film. The physicality of it, the properties of sand, are studied in minute and fetishistic detail. The same attention is paid to flesh, though it’s a sensuality of a very unnerving kind. The sexual cravings on display are not quite animalistic and not quite automatic. Jumpei does not seem to desire the woman in any romantic sense, but she is there and he is there, and arousal springs from the close contact. What Teshigahara (and Abe) is saying about sexuality is as slippery and mysterious and layered as the rest of it. It’s a film about so many things that I fear if I start exploring them all I may be sitting here typing all night long. Freedom and work and exploitation and fascism and the erosion of the human spirit. Moral codes are redefined, shifting as much as the sand that must be constantly shoveled out, a Sisyphean task. And is Jumpei’s work any less pointless? Is it any less of a trap? 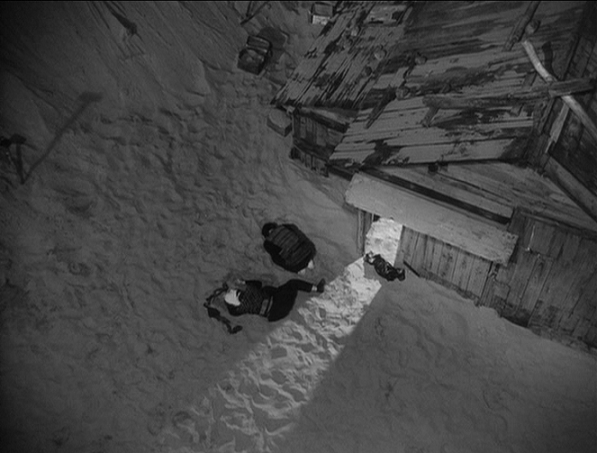 As I said in my review of Pitfall the other day, much of the credit belongs to cinematographer Hiroshi Segawa and composer Tôru Takemitsu. The images are gorgeous and surreal, full of intense and revealing close-ups. The pit and its barely-held-together abode are otherworldly. Takemitsu’s score is haunting, creaky and as inextricably linked with the unsettling nature of the film as the music in The Shining. This entry was posted on February 27, 2013 at 8:59 pm	and is filed under Movie Reviews. You can follow any responses to this entry through the RSS 2.0 feed. You can leave a response, or trackback from your own site.